Are you the owner of Klutina River Campground in Copper Center Alaska? Did you know that the fishing is HOT on the Klutina River with the Alaska salmon Fishing charters from Klutina Charters in Copper Center. Salmon fishng on the Klutina River begins to really heat up in June with the arrival of the Copper River Sockeye Salmon and continues well into the summer. Description - One of the most popular destinations for fishermen every summer can be found on the banks of the Klutina River near Copper Center. RV sites are level and well packed gravel. Most have river frontage and fishing is available right in front of your RV. This is Alaska are it's best, a real anglers paradise and a welcome family destination too. Every Tuesday night Klutina Salmon Charters hosts a bonfire and ice cream social. All campground guests are welcome to join. Directions - Drive roughly 180 miles from Anchorage through towns like Palmer, Sutton and past Mat Glacier and on to the town of Glennallen located where the Glenn Highway and Richardson Highways meet. Turn towards Valdez and travel about 5 miles to the Old Richardson Highway turnoff. Turn left onto the Old Richardson Highway and travel to the signs for Klutina River Charters. Water - Available - not at site. Klutina River Campground in Copper Center Alaska includes camping right on the banks of the Klutina River near Copper Center and Glennallen Alaska. 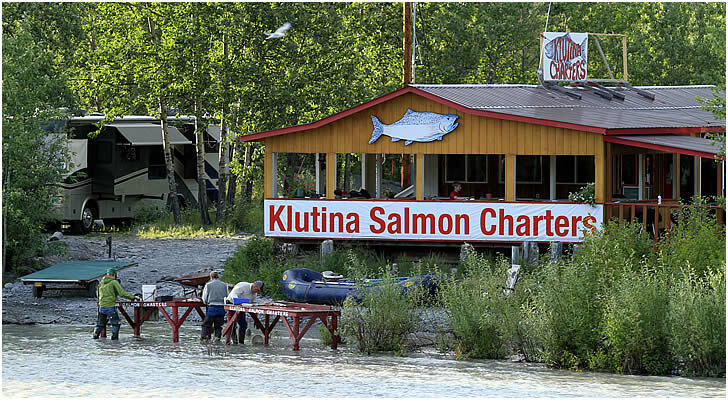 Klutina River Charters offers great Alaska salmon guided fishing charters and boat services along with river front camping, cabin rentals, tent sites and rv hookups like 30 amp electric. Fishing on the Klutina River for Copper River Sockeye is hot in late June and well into July. Call Klutina River Fishing Charters or the Klutina River RV Park for more information.